(NaturalNews) Bishops of the Catholic Church in Kenya have for years warned residents of the country not to get the World Health Organization's polio vaccine. The reason the clergy have urged Kenyans to refuse this vaccine was stated simply and concisely in an article by Steven Mosher, President of the Population Research Institute and author of the book Population Control: Real Costs, Illusory Benefits: "Given that they have been subjected to more than a half century of population control programs under the guise of 'family planning' and 'reproductive health,' who can blame them?" Ten million of Kenya's 45 million residents are Catholic, and the Catholic "Church has an extensive network of health facilities that include 58 hospitals, 83 health centers, 311 dispensaries and 17 medical training institutions," according to a October 7, 2014, press release by the Catholic Health Commission of Kenya. The bishops called for a boycott of the polio vaccination campaign due to reservations about the safety of the vaccine. The bishops said they wanted "to carry out more independent testing on the vaccines to make sure they don't contain estrogen derivatives, which they claim are being used to sterilize women and children," Care2.com reported on August 14, 2015. 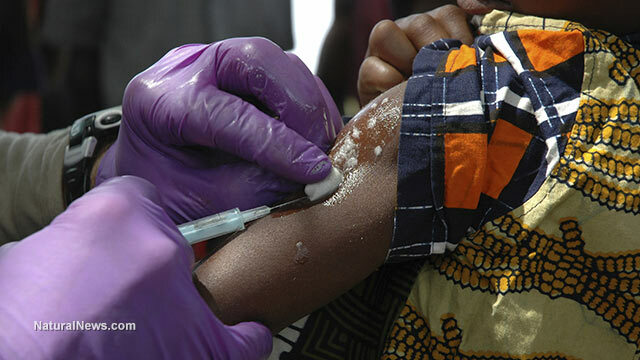 Also, a recent incident where roughly 30 children in western Kenya were injected with an anti-malarial drug and "reacted with apparent paralysis added to the bishops' concerns over the polio vaccine, with the bishops questioning the contents of the injection in that case as well," LifeSiteNews.com reported on August 3, 2015. The Rockefellers, "some of the world's most ardent financial backers of eugenics, have been at the center of the developments around what was named polio and its 'vaccine,'" according to F. William Engdahl's article "Polio or Something More Sinister?" "Eugenics was a fraudulent social theory that a 'better society' could be created by eliminating 'undesirable' human blood lines and promoting the desirable types like those of Rockefellers or DuPonts or their likes," Engdahl explains. "To the present day eugenics is the guiding ideology of the very rich, loveless American oligarchs including Bill Gates and David Rockefeller." The "major financial backers of the criminal activities of the UN WHO (World Health Organization) and their fraudulent swine flu pandemic scares are the Rockefeller Foundation and the Bill and Melinda Gates Foundation," Engdahl reports. Under the heading "Gates, GAVI and Murder Inc.," Engdahl explains, "Several years ago, the Bill and Melinda Gates Foundation and the Rockefeller Foundation, along with the World Bank, UNICEF, the WHO and a group of pharmaceutical companies, united all in something called GAVI and set out to bring massive polio vaccination first to India." "GAVI: The Vaccine Alliance was founded by the Gates Foundation in 2000 as a 'public-private partnership' to unite in assaulting poorer developing countries with the Big Pharma vaccine industry they would otherwise be spared," he writes. But their polio vaccination program is killing and paralyzing tens of thousands of children, he warns. It caused "48,000 cases of... Acute Flaccid Paralysis, a condition the WHO admits is clinically indistinguishable from polio and which occurred in direct proportion to the doses of polio vaccine received." "The Gates-Rockefeller-WHO polio vaccination program in Pakistan killed an estimated 10,000 and crippled tens of thousands more," he also points out. "The polio spreading through Syria is 'vaccine-derived polio,' specifically," he reports, "the same strain of 'non-polio acute flaccid paralysis' as in India and Pakistan that coincided with the mass vaccinations with Sabin oral vaccines by GAVI." If this all sounds improbable, Engdahl says, take a look at the recent expose by Kenyan doctors about a vaccine developed by WHO with the Rockefeller and Gates Foundations. "The Kenya Catholic Doctors Association discovered an antigen that causes miscarriages in a tetanus vaccine that is being administered to 2.3 million girls and women by the World Health Organization and UNICEF," he reports. "Since 1972 the Rockefeller Foundation has worked in secrecy with the WHO and various pharmaceutical companies to fund a WHO program in 'reproductive health,'" he notes. "There they developed an innovative tetanus vaccine." The WHO oversaw massive vaccination campaigns, in the early 1990s, against tetanus in Nicaragua, Mexico and the Philippines. "Comite Pro Vida de Mexico, a Roman Catholic lay organization, became suspicious of the motives behind the WHO program," he explains. "When they tested numerous vials of the vaccine they, like in Kenya today, found they contained the same Human Chorionic Gonadotrophin, or HCG." HCG, when combined with a tetanus toxoid carrier, "stimulated the formation of antibodies against HCG, rendering a woman incapable of maintaining a pregnancy, a form of concealed abortion," he reports. "They found that to be very curious in a vaccine designed to protect people against lock-jaw arising from infection with rusty nail wounds," he writes. "Tetanus is also rather rare, so why a mass vaccination campaign and that for only women of child-bearing age?" As Steven Mosher pointed out in an open letter dated December 22, 2014: When the Nazis sterilized Jews and others in Europe, historians called it the Holocaust. When officials sterilized mentally disabled people and minorities in the US, Hollywood called for the screen rights. But when population controllers sterilize women in Kenya against their will and without their knowledge, they call it "health care." Engdahl says the pattern is clear: "The global agenda of Rockefellers, Gates, Clintons, Bushes and their very rich loveless friends is racist. It calls for elimination of non-white populations, genocide." On December 10, 2015, The Star of Kenya reported the death of a two-week-old baby girl in the center of the country who received two doses of a polio vaccine two days apart. Her mother, Ann Wanjiru, told the reporter that she asked community health workers why the baby needed another dose two days after the first one. "I told the health workers my child had taken the polio vaccine on Friday but they said there was no problem with her taking another dose," she said. "I questioned them twice but they insisted she must take it."